QuestionWhich movie theater arm rest is yours? Hopes&Fears answers questions with the help of people who know what they're talking about. Today, we try to figure out which one of the two arm rests you should be using at the movie theater. Nobody likes strangers. They have all the properties of a familiar person’s body—the sounds, the odors, the spasms—and yet they are unfamiliar, rending their properties alien, uncertain and possibly sickening to a normal person such as yourself. Consider the theater space as an equalizing environment. You’re all in it together, friends and foes alike. It’s dark in there. Maybe you’re alone. You try to sit as far from strangers as possible, but it isn’t always possible, you know? Sometimes you’re in the mood for a sold-out blockbuster. 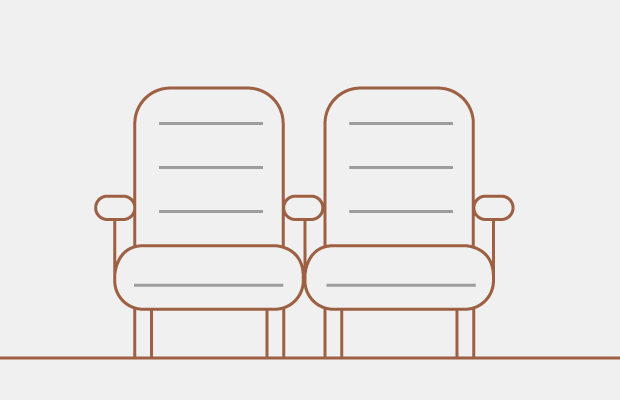 When you sit between strangers, which arm-rest is yours—left or right? The power dynamics here are complex. Also, what if there are cup-holders? We have a lot to unpack, so we asked a few experts. The Constitution states that all people are created equal, but our forefathers did not know how annoying movie theater patrons of the future would be. We have no federal or state laws to define who gets what in the elbow real estate war. Speaking only for myself, I say that both arm rests are mine. If you dont like it, take them back from me. Sure, I'll play passive/aggressive with you, but I generally do whatever it takes to keep my arms comforted. Even if that means sharing. Like everything, sometimes you win, sometimes you lose. I don't always get my way, more powerful contenders get there first or knock me out. But I always get back up and put my elbows where they should be, at my side. Elbow nubs touching is... Listen, it's a dog eat cat world and everyone wants two. If you don't step up, then you are shut out. The statistic that 90% of humanity is right-handed, yet 20% of violent crimes are committed by lefties is not at all surprising. Living in a world constantly reminding you of your otherness, with a steady stream of daily minor defeats - smudged handwriting, cord entanglement, cuts and burns - resentment can smolder to the breaking point. And yet, I’ve never had a problem at theaters. The left-handed rest is unquestionably mine. Sure, I’ve rarely had to side-slam an insistent arm, but even in a darkened room the latent rage must give off palpable scent as the encroaching elbow inevitably concedes. But I should give fellow moviegoers more credit - we’ve all gathered to indulge imagination for an hour or two. Perhaps they’re willing, even intrigued, to add a dimension of sinister physical reality to their experience. Or in the spirit of communal viewing, to invert the norm and let me live a brief time in a world where left is right. I am a humanist, so this sort of en masse societal angst pains me. In a flourish of goodwill, I’ve taken it upon myself to address the issue by making an effort to always take any potentially disputed items for my own. My friends and relations—and even acquaintances or strangers—are no longer mired in unseemly anguish surrounding in-demand items that enter their lives. With this in mind, I’ve begun taking both armrests when I find myself at the opera, or perhaps a Broadway show. It brings me great peace of mind to know that my left and right seat mates are breathing sighs of relief, recognizing that they won’t need to be the one to “take the plunge,” so to speak. But I rarely go to the films anymore, because cinema is the crypto-fascist propaganda wing of a murderous, dictatorial government that preys upon the life of the people through state violence, torture, and biotelemetric mindcrime.